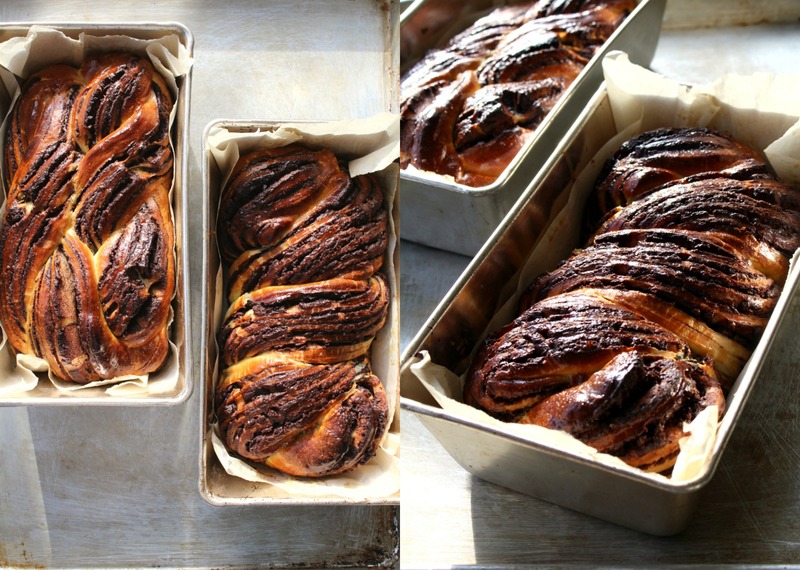 It’s time for some chocolate babka, I think. To celebrate the time of year when you can turn the oven on to warm the house. 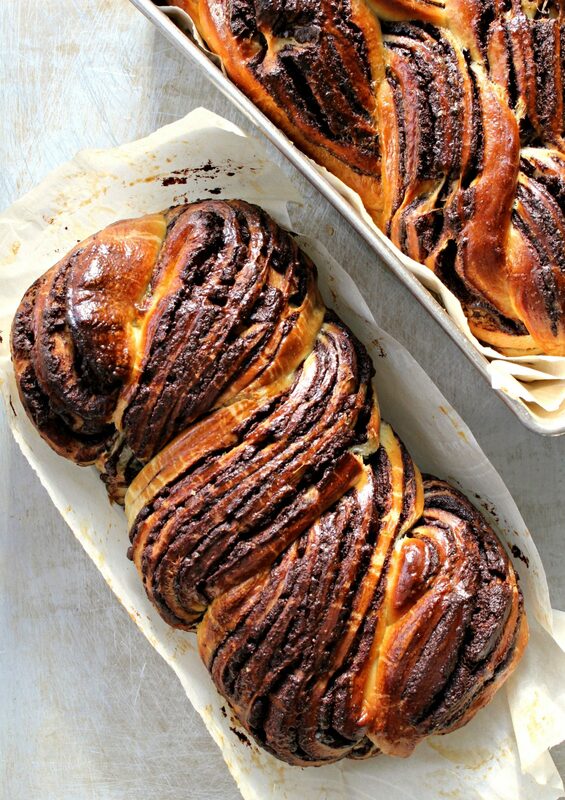 If you’re only familiar with babka thanks to Seinfeld, it’s a sweet, rich yeasted dough that some call cake—but really it’s a loaf of sweet dough with the texture of a soft cinnamon bun, rippled through with so much chocolate (or cinnamon, which is considered a lesser babka, but it’s on my list to make next—who wouldn’t love a loaf-shaped cinnamon bun?) 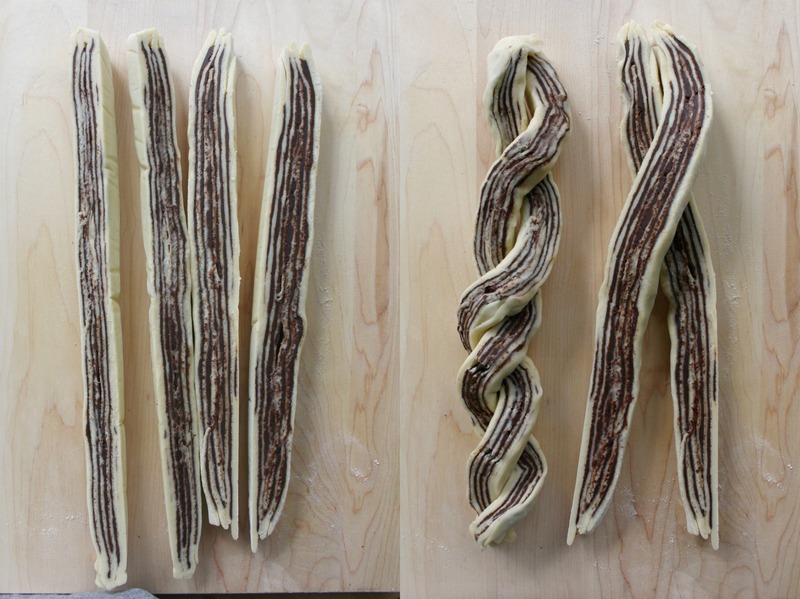 as to make slicing the rolled log (which you do lengthwise, before twisting it into the pan) a challenge. 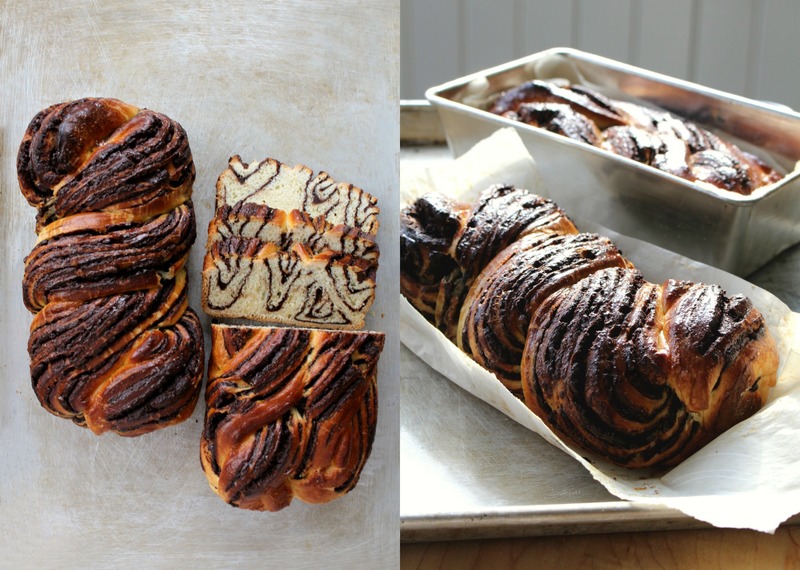 I took babka for a spin a few times to get a feel for it, in the name of research of course—the soft, rich dough is lovely to handle, and it’s like assembling a cinnamon bun, up until the dough is filled and rolled into a log. Some of the chocolate fillings out there are crumbly, others smooth, which I found easier to handle when it comes to the twisting part, which I find ridiculously satisfying. 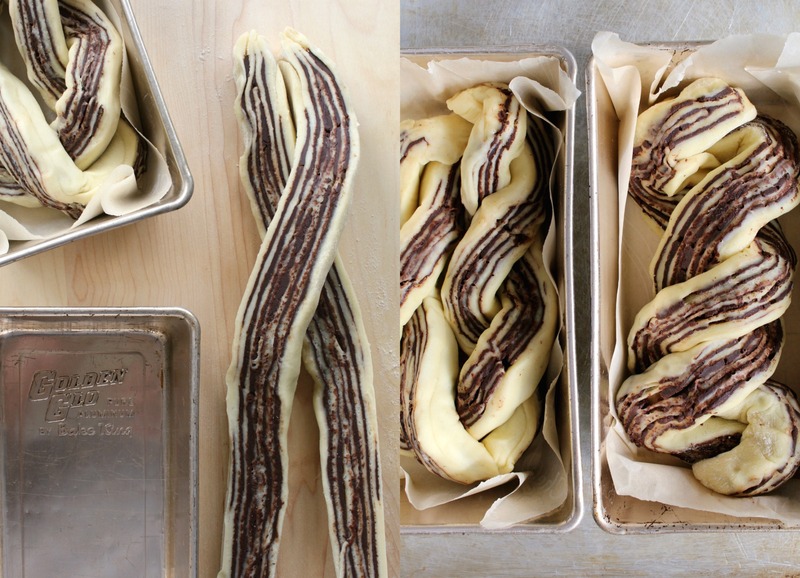 Some babkas are shaped in a figure 8, some criss-crossed and twisted, and really so long as it’s twisted and tucked into the pan, it’ll turn out beautifully—babka does not demand perfection. Brush the tops with a little beaten egg for a bit of gloss and you’re good to go. Really, no one is going to criticize the patterned cross section of your babka. This recipe makes two loaves—enough for a few friends to come by for brunch (or just coffee and babka) or one to bake and a second to freeze. It’s good to have frozen assets heading into the holiday season. Also, PS: if it occurs to you that it might make sublime french toast, consider the fact that sweet stuff tends to burn, and keep the heat low. Here’s to a long weekend full of food, family and friends. I’m already wearing my stretchy pants. 2In a small saucepan, melt the butter and chopped chocolate over medium-high heat, stirring until smooth. Remove from the heat and stir in the brown sugar and cocoa; the mixture will have the consistency of thick paste. 3Line two 8x4-inch loaf pans with parchment. Punch the dough down and divide it in half. Roll out each piece on a lightly floured surface into a 10x12-inch rectangle. Spread each piece with half the chocolate mixture. Starting at a long side, roll up jelly roll style. To shape the loaves, either turn the ends together, pinching to make a ring, stretch the ring out even wider and twist it twice, like a double figure 8, and tuck into the pan, or cut the log in half lengthwise, lay them side to side and pinch them together at the top to join, then weave the pieces back and forth over each other, like braiding but with only two pieces. Tuck into the baking pan, tucking in the edges. Don’t worry about it being perfect. 4Cover and let rise for another hour or two. When you’re ready to bake, preheat the oven to 350F, brush the tops of the loaves with beaten egg, and bake for 30-40 minutes, or until deep golden. (Some recipes say the bottoms should sound hollow when tapped, but I find the dough is too dense and loaded with chocolate for this to be an accurate gauge.) Try to let them cool almost completely before slicing - but chocolate babka is pretty fabulous while it’s still warm. Bravo!!! That’s gorgeous and the house must have smelled divine. OMG that looks amazing!!! Do you have any photos you could share of layering the chocolate in the dough? I’m so excited to try this recipe!!!! Hmm.. I might have missed them but I’ll look! it’s really just spreading chocolate on dough.. doesn’t have to be perfect! Sorry, clicked before I could identify myself. (It’s that kind of a day, today.) It’s Margaret from Kitchen Frau. Hi Julie – for the filling, is the egg in the ingredient list added TO the filling, or is is just for the egg wash? (It’s not mentioned in the “method” for the filling…) Just wondering. I can’t wait to get this puppy in the oven! Fabulous! Looked difficult (to me) but really wasn’t and absolutely worth it. Thank you so much for this delicious recipe. I have made it twice now, both with beautiful results. If you freeze the second one do you twist, put in pan, cover and freeze? Then thaw and allow the second rise before baking?